According to the Book of Genesis, Enoch (/ˈiːnək/; Hebrew: חֲנוֹך‎‎ Ḥanōḵ) was a son of Cain, grandson of Adam, and father of Irad. 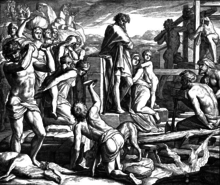 After Cain arrived in the Land of Nod, to which he was evicted by the Lord as his punishment for murdering his brother Abel, his wife (and sister) became pregnant and bore Cain's first child, whom he named Enoch. The city Cain founded in the Land of Nod was named after his son (Genesis 4:17). According to Jubilees 4:9, Enoch's mother/aunt was named Awan. This Enoch wages war against God, just as his father Cain, and is not to be confused with Noah's ancestor Enoch.